US President Donald Trump has said he may pardon boxing legend Muhammad Ali for a draft-dodging conviction, even though it has already been overturned. Mr Trump told reporters before he left the White House for the G7 summit that he was "thinking about" the late boxer and some others "very seriously". Ali was convicted in 1967 after refusing to fight in the Vietnam War. 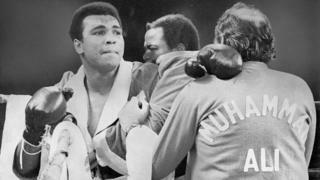 But a lawyer for his family said it was "unnecessary" as Ali was pardoned by the Supreme Court in 1971. "We appreciate President Trump's sentiment, but a pardon is unnecessary. The US Supreme Court overturned the conviction of Muhammad Ali in a unanimous decision in 1971," said Ali's lawyer Ron Tweel in a statement. "There is no conviction from which a pardon is needed." Mr Trump reportedly said Ali, who died in 2016, was one of 3,000 people he was considering pardoning, saying many of these people "have been treated unfairly". "I'm thinking about Muhammad Ali. I'm thinking about that very seriously and some others," the president said. Media captionAre presidential pardons Trump's secret weapon? Donald Trump has fallen in love with the presidential pardon. Or, at the very least, he's enamoured by the spectacle and speculation that he's managed to create by publicly entertaining ways to use his broad pardon power. Never mind that Muhammad Ali, whose conviction for draft-dodging was overturned in 1971, has no criminal record that needs presidential expungement. Never mind that Ali died two years ago, with his legacy as a boxer and a civil rights icon intact. The president is, as the saying goes, just spitballing. He's throwing names out and clearly enjoying the new game he's created. The president even suggested he might entertain pardon recommendations from NFL players who have protested police discrimination and violence during the national anthem - the same individuals whose patriotism Mr Trump has publicly questioned. If all of this sounds a bit confusing or surprising - that may just be the way Mr Trump wants it. If nothing else, his presidency keeps everyone guessing as to what will happen next. Ali was a conscientious objector to the Vietnam War. He said fighting in a war he did not believe in would disgrace his religion, his people and himself. Mr Trump's comments follow his pardon of conservative political commentator and author Dinesh D'Souza, and his granting of clemency to Alice Johnson after lobbying by Kim Kardashian West. Why did Trump pardon Dinesh D'Souza? The president has recently mooted pardons for lifestyle personality Martha Stewart and former governor of Illinois Rod Blagojevich. Mr Trump also recently said he has the "absolute right" to pardon himself in the Russia inquiry, although he insists he has done nothing wrong. The president has expressed admiration for Muhammad Ali before. He has posted on Instagram a photo of himself meeting Ali at a past event. When he died, Mr Trump called him "a truly great champion and a wonderful guy" in a tweet. Ali famously declared he "ain't got nothing against no Viet Cong" after he was reclassified as eligible for service. After refusing to serve, he was stripped of his boxing titles and did not fight for three years while he appealed, until his conviction was quashed by the US Supreme Court. President Jimmy Carter also offered a blanket pardon in 1977 for any draft dodger who requested one. Video Are presidential pardons Trump's secret weapon? Donald Trump: Could the US president pardon himself?